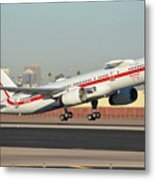 Honeywell Boeing 757-225 N757hw Phoenix Sky Harbor January 14, 2016 by Brian Lockett - 10.000" x 6.625"
Honeywell Boeing 757-225 N757hw Phoenix Sky Harbor January 14, 2016 framed print by Brian Lockett. Bring your print to life with hundreds of different frame and mat combinations. Our framed prints are assembled, packaged, and shipped by our expert framing staff and delivered "ready to hang" with pre-attached hanging wire, mounting hooks, and nails. 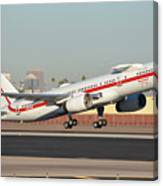 There are no comments for Honeywell Boeing 757-225 N757hw Phoenix Sky Harbor January 14, 2016. Click here to post the first comment. 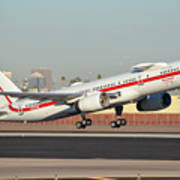 Honeywell Boeing 757-225 N757HW a departing from Phoenix Sky Harbor for Ottawa MacDonald-Cartier International, Ontario on January 14, 2016.